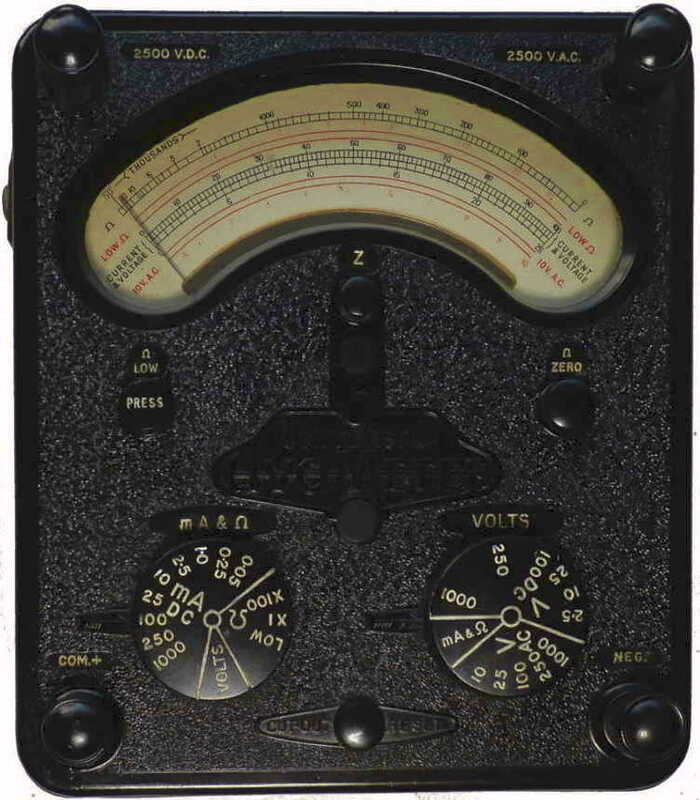 The High Resistance AVO universal multimeter was a significant development of the range of AVO multimeters which started life back in 1923, and many of the original features remained almost unaltered right through to the meter shown here. The firm also produced a range of smaller multimeters, the AVO Minor and later the AVO Multiminor as well as a number of special instruments such as the Heavy Duty model. Production of the iconic model 8 meter ceased in 2008. Though known for their Avometer general purpose multimeters, they made a wide range of test gear including valve testers, oscillators and light meters. You will find more information here about these instruments and other similar models. AVO also produced a range of smaller multimeters which are described here. This is the first 20,000 ohms per volt AVO multimeter, it preceded the the more versatile model 8 which was renowned for its reliability, robustness and the incorporation of a mechanically operated cut out linked to the meter movement. The two switch range selection system has endeared the latter to generations of radio and television engineers. But unlike the later model 8 has no transformer or AC current ranges. The higher sensitivity movement enabled High-voltage terminals to be added. Also unlike the Model 7 and Model 40 there is no Q knob or 'divide by 2' button but there is a low resistance range (0-20 ohms full scale) which is activated by pushbutton. This is one of two versions sometimes called High Sensitivity models introduced in 1948 [a screened panclimatic variation was also made] and are updated versions of the model 7 designed to be more suited to radio and television servicing. It is housed in an Bakelite case similar to the previous models but equipped to to take one 4.5 Volt battery and one 1.5 Volt cell. The battery compartment for the latter will take two such batteries AVO suggests that one is a spare, if you only have one some form of packing will be needed to keep the the battery in position. You will note that this instrument has a Low Ohms range which is is scaled upwards from left to right unlike the other two more conventional ranges. Rather than using the meter movement to measure the current through the unknown resistance it is connected so as to measure the voltage across the unknown resistance. When I acquired this meter in 2015 it had a missing battery cover, a bent pointer, two open circuit resistors and two fried ones. Initially I found it worked fine on DC current and voltage, Low and X100 resistance ranges and the AC ranges. The bobbin resistor in series with the 4.5 Volt battery was open circuit but fortunately marked with its resistance value (47.5k) so I could replace it with a selected 47k resistor. This meter would have had a Bakelite battery cover with slots for probes so I have taken a suitable one from a Model 7 meter and made an aluminium replacement for the latter. By trial and error I got the X1 resistance range working by shunting the burnt out wire wound resistor with 330 ohms but it read about 10% high. I was fortunate in being sent a circuit diagram from PM Munro and this prompted me to check the fried resistor which was not open circuit only to find that it had shorted turns. Touching it caused it to rise to its correct value. A coating of shellac varnish hopefully cured that and the addition of selected 330 and 33 ohm resistors in series gave the requisite 353 ohms. After straightening the pointer and reassembling the meter works as intended and is surprisingly accurate. The resistors mentioned are those connected between the three left hand tags on the lower component board. Only after re-assembling the meter did I notice "V.T.Ltd" in the corner of the scale plate. Does this mean that the meter was outsourced and if so by whom or was it specifically made for a particular firm? Now cleaned and given the AVO recommended application of light machine oil it looks much happier though the red scale markings have faded over the years. The text that is blacked out reads as follows on the panclimatic model which is housed in a screened casing. "The instrument as a whole is magnetically screened in a metal case, this is not being connected electrically to the circuit"
Batteries A 1.5 volt cell with a brass terminal and a flying lead for the negative connection and for the highest resistance range a single 4.5 volt cycle lamp battery with brass spring connectors was used which is still available. The 1.5 volt cell can be replaced with a single cell size D to with soldered connections. What is it worth? I purchased this one together with a model 7 Mk2 for � in 2015. They were only made for a couple of years so fairly unusual, so I guessing � or more. What is the difference between this model and a model 2? The model 2 measures resistance up to 20 Megohms rather the 5 Megohms of the model 1.